Some 13,000 years ago, during the Ice Age, Quechee, like the majority of our continent, was covered by a glacier. As the glacier receded from the ocean waters, the melting waters slowly and steadily cut away the bedrock ridge that has become Vermont’s most spectacular natural wonder, Quechee Gorge. Enjoy beautiful vistas 168 feet above the Ottaquechee River, have a picnic overlooking the waterfalls or get something to eat at the snack bar. Enjoy hiking or walking the trails along the mile-long chasm. 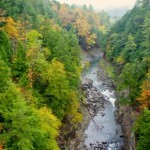 Quechee Gorge Village, Public House Restaurant and State Park are located within walking distance of the Gorge. Visit the Quechee Gorge Visitors Center, built in 2005. It offers ample bus parking and public restrooms. This two-story building with an elevator houses the Chamber of Commerce and Information Center. Walking trails abound; shopping and restaurants are across the street. Tours always welcome, ample parking for buses and there is no admission fee.